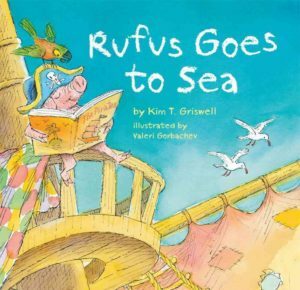 Rufus Goes to Sea was written by Kim T. Griswell. It was illustrated by Valeri Gorbachev. I was provided a copy of this book in exchange for my honest review. All opinions are my own. Ahoy—Pirate Pig on board! What does a book-loving pig like Rufus do when school's out for summer? He turns to his favorite stories for inspiration, of course! And before long, he's dreaming of days filled with adventure and nights under blankets of stars. It's the pirate life for him, matey. But Captain Wibblyshins says NO PIGS ON PIRATE SHIPS! After all, pigs get tangled in the rat lines, they picnic in the crow's nest, and worst of all, they even wipe their chins with the Jolly Roger. Can Rufus convince the Captain that he's no landlubber swine? And could his ticket to piratehood be . . . reading? Kids will love seeing Rufus conquer new worlds in this delightful follow-up to the popular Rufus Goes to School. In Rufus's first book "Rufus Goes to School", Rufus figures out how to go to school... even with the principal saying "NO PIGS IN SCHOOL!'. Now he's on a new adventure and needs to figure out how to get the Captain to agree to forget about his "NO PIGS ON PIRATE SHIPS!" rule. Rufus really is an adorable little pig... and I think that preschoolers will love him... and early readers will find the story's slight repetition and predictability fun to read. Rufus certainly is a persistent little pig. It's fun to find out with Rufus just what kind of skills the Captain is looking for in his new pirate. Kim T. Griswell is a developmental editor for Uncle John's Bathroom Readers and the former coordinating editor of Highlights for Kids. She continues to help develop and teach writers' workshops with the Highlights Foundation; has taught with the Institute for Children's Literature; and has published more than 200 short stories, articles, and columns. Her children's book, Carnivorous Plants, was published by Kidhaven Press, and she also wrote Rufus Goes to School (Sterling). Kim lives in Ashland, OR. Learn more about her at her website, kimgriswell.com. Valeri Gorbachev emigrated from his native Ukraine to the US in 1991, and now lives in Brooklyn, NY. He has written and/or illustrated more than 50 children's books, including the first Rufus story, Rufus Goes to School (Sterling), as well as Turtle's Penguin Day and The Giant Hug by Sandra Horning (both Knopf). I have a copy of Rufus Goes to Sea to give to a reader. If you would like to enter to win... please simply scroll down below the post and "sign up for our weekly email" with your name and email address! Then enter your email for verification in the Rafflecopter. Once a week you will get an email that keeps you up to date on everything we're sharing. If you're already on the mailing list... I already have your email address... just enter it in the Rafflecopter form so I can verify!